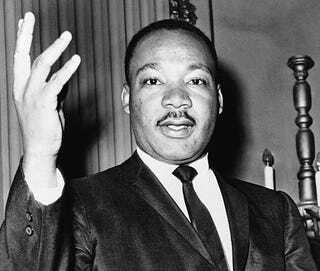 Today's the day when we celebrate the life of visionary leader Martin Luther King, Jr. But the civil-rights legend is also an important figure in science fiction... as an influence, and an occasional character. Nichelle Nichols decided to quit playing Lt. Uhura at the end of the first season of Star Trek, because she felt the role wasn't stretching her as an actor, and she wanted to return to the theater. But then she met a Star Trek fan at an NAACP event: Dr. King, who asked her to reconsider because of her character's tremendous visibility. Ammonite author Nichola Griffith says that MLK's marches and speeches coincided with a new wave of science fiction that asked readers to identify with "the Other." For example, John Wyndham's The Crysalids is told from the point of view of a mutant. Author Harlan Ellison marched with Dr. King from Montgomery to Selma. So did Sulu actor George Takei. Robert J. Sawyer quotes MLK in several of his books. He has one fictional president quote the "I Have A Dream" speech, and has his characters discuss "the content of his character" in another story. One of his novels begins with a quote from MLK: "Though the arc of the universe is long, it bends toward justice." We cast an African-American actor because he was the best actor from among our friends. And when we finished the film, literally as we were driving it to New York in the trunk of a car, that was the night Martin Luther King was assassinated. So the movie became a reflection of the times. There's a certain anger in the movie already, but a lot of why that film gets applause is because Wayne is a black guy. In the script, his race is never mentioned. In my mind, when I wrote that initial scene, he was a white guy. And he would've been shot by the police even if he was a white guy. But because he happened to be an African-American, that made it much stronger, particularly after the assassination. We shouldn't take all the credit for that. A lot of it was an accident. The fictional character most frequently compared to MLK is, of course, Charles Xavier, the leader of the X-Men, a mutant organization that includes a school for gifted and talented mutants. Xavier wants mutants to live in peace among the normal humans, and assimilate as much as possible- in contrast to the mutant villain Magneto, who's usually compared with Malcolm X. The first X-movie makes this comparison more explicit, by having Magneto utter the words "by any means necessary." But Professor X isn't the only MLK surrogate out there. Paul Fenster, the African American civil rights leader in Samuel Delany's Dhalgren, is frequently described as representing the recently assassinated MLK. He's described as a "colored man up from the South, some civil rights, militant-type person." And the chaos that envelops the midwestern town of Bellona, cut off from the rest of the world, is reminiscent of the riots that struck after King's assassination. John Barnes' novel Earth Made Of Glass takes place on a planet torn by racial hatred. The only hope is a prophet named Ix, who's portrayed as a Martin Luther King archetype. DC Comics' black superhero Amazing Man didn't manage to save MLK from an assassin's bullet, but he was a responsible for apprehending shooter James Earl Ray afterwards, in the DC version of events. The last Martin Luther King holiday the nation would ever observe dawned on an extraordinary sight. In the night, the Space Traders had drawn their strange ships right up to the beaches and discharged their cargoes of gold, minerals, and machinery, leaving vast empty holds. Crowded on the beaches were inductees, some twenty million silent black men, women, and children, including babes in arms. As the sun rose, the Space Traders directed them, first, to strip off all but a single undergarment; then, to line up; and finally, to enter those holds which yawned in the morning light like Milton's "darkness visible." The Star Trek anthology Strange New Worlds IV includes a story about the psychiatrist who treated Benny Russell, Captain Benjamin Sisko's 1950s science fiction writer alter ego. (Sisko had a hallucination/vision that he was a 1950s SF writer. Sort of.) In the story, the doctor hears of the assassination of Dr. King, and thinks about his former patient and his stories of a post-racism future Starfleet for the first time in years. In Roger Corman's batty 1970 film Gas, Or It became Necessary To Destroy The World In Order To Save It, aka GAS-S-S, an experimental nerve gas kills everyone in the world over the age of 25. At the end, all the characters are running around, and people wearing masks of JFK, MLK, Che Guevara and Alfred E. Neuman show up. In Christopher Pike's young-adult Remember Me book series, a woman named Shari Ann Cooper dies, but her spirit winds up in another dimension. She visits demonic aliens on Mars and then goes inside a black hole and nearly gets atomized. But she finds out she's supposed to return to Earth in the body of a living person, as a Wanderer. And it turns out Martin Luther King and Malcolm X were both alien-possessed Wanderers as well. In the children's TV series A.J. 's Time Travelers, A.J. Malloy travels through time in a ship called the KYROS. In one episode, he decides to celebrate Martin Luther King day by traveling back to witness the famous "I Have A Dream" speech first-hand. But in a (no doubt hilarious) mishap, he sets the coordinates wrong and arrives too early. Instead, A.J. meets King as a teenager, and uses his "time telescope" to share with him a vision of the future, inspiring him to fight to end segregation in America. Commenter Grey_Area points out that Harry Turtledove features MLK in many of his alternate histories. In particular, The Two Georges — cowritten with Richard Dreyfuss of all people — features an alternate America where the Revolutionary War never happened. Sir Martin Luther King is governor general of the North American Union, and Richard Nixon is a used car dealer. Also, commenter LutherCypselus says MLK puts in an appearance in David Brin's alternate history graphic novel The Life Eaters, in which the Nazis won World War II with the help of the Norse Gods. MLK is one of a number of leaders of the Brotherhood of the Fish, an alliance of the Abrahamic religions against the "pagan death gods." Writer Brent Adrian maintains a list of ideas that you can use to start a science fiction story, if you're in need of inspiration. One of his suggestions: an alternate history tale that takes place in a world where the first MLK assassination attempt succeeded. In 1958, a woman stabbed Dr. King in the neck, and he nearly choked on his own blood. If she'd succeeded, who would have replaced MLK in the civil rights movement? Would anyone have been able to? What if MLK had attended the 1956 Dartmouth workshop on artificial intelligence? That's the question this research paper by Will Fitzgerald at Kalamazoo College asks. Would A.I. research be more humanistic, and possibly more self-aware? He quotes MLK, right before his death, talking about the "technological revolution" of "automation and cybernation," and lamenting its failure to advance human rights.